We have entered Autumn quite abruptly here. There I was, bobbing along, thinking ‘Ahhh Autumn is so lovely, look at the leaves, look at the snuggly blankets, look at ALL THE PUMPKINS!! !’, happily forgetting that actually, Autumn can get really damp and cold. I’m all for Autumn, I do love it, but getting around when it’s windy, rainy and chilly is hard on the skin. My hands in particular become more crackly and dry that an extremely dry crackly thing. This means that I need industrial strength moisturisation and to find the best hand cream that I can. My absolute favourite hand cream is L’Occitance Cherry Blossom, which is lovely to use and smells how I imagine actual heaven to smell. But, when the going gets tough, it just can’t cut it on it’s own. 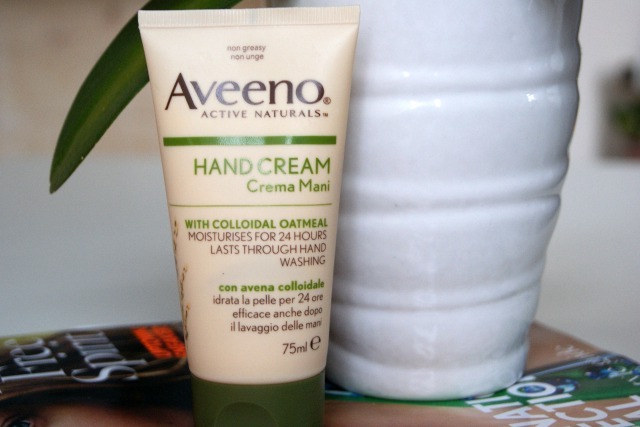 Aveeno hand cream is probably the most effective hand cream I’ve ever tried. It contains colloidal oatmeal for moisture and says that it lasts 24 hours through hand washing. Whilst I think the 24 hours bit is a tad dramatic, it does hold up nicely when you wash your hands and you don’t instantly feel like you need to apply more. It’s very effective but it’s also a no frills moisturiser which means it smells less like heaven and more like, erm, hand cream. When I say that, I mean that it smells of hand cream without anything added to make it smell lovely. It’s actually quite hard to describe, it’s not a pleasant smell, but it isn’t unpleasant or overpowering either. What it lacks in luxury, it makes up for in effectiveness and considering the price (£5.45) it is really good value for money and easy to find in a lot of shops. And it saves me from monster claws – brilliant. It’s also on offer in Boots right now, for the bargain price of £3.63. As always, i LOVE your comments. Let me know if you’ve ever tried this hand cream, or if you have a favourite.